A SiK Telemetry Radio is one of the easiest ways to setup a telemetry connection between your Flight Controller and a ground station. This article provides a basic user guide for how to connect and configure your radio. This page was previously named 3DR Radio (version 2) for 3DRobotics’ trusted high quality implementation of SiK radio. As this radio is no longer available from 3DR, the page has been renamed to reflect the underlying open source radio platform. A SiK Telemetry Radio is a small, light and inexpensive open source radio platform that typically allows ranges of better than 300m “out of the box” (the range can be extended to several kilometres with the use of a patch antenna on the ground). The radio uses open source firmware which has been specially designed to work well with MAVLink packets and to be integrated with the Mission Planner, Copter, Rover and Plane. If you’re looking for an alternative, the RFD900 Radio Modem is highly recommended by many community members (The SiK platform was based on the RFD900 and both platforms have continued to evolve). It provides a significantly better range. The radio has interchangeable air and ground modules, meaning that you use them as a pair but it does not matter which one goes on the vehicle and which remains on the ground. The radio has a micro-USB port, and a DF13 six-position port. The following sections explain how to connect these to flight controllers and ground stations. 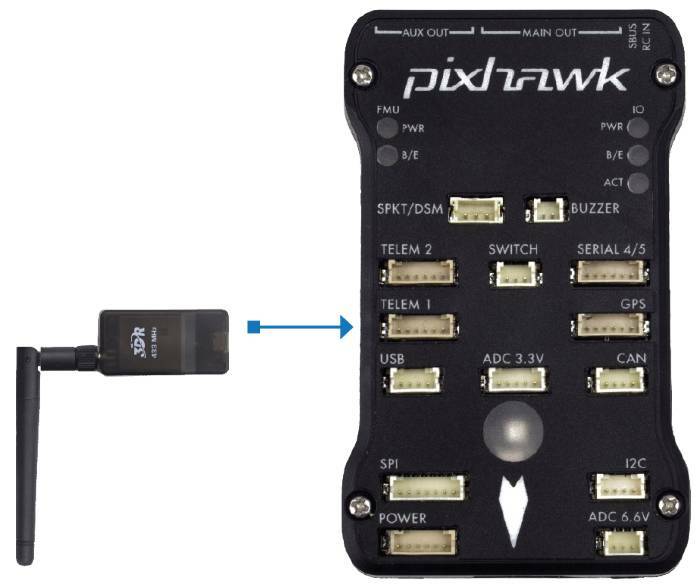 Use the 6 pin DF13 connector that should have come with the radio to connect the radio to your Pixhawk’s “Telem 1” (“Telem 2” or “Serial 4/5” can also be used but the default recommendation is “Telem1”). 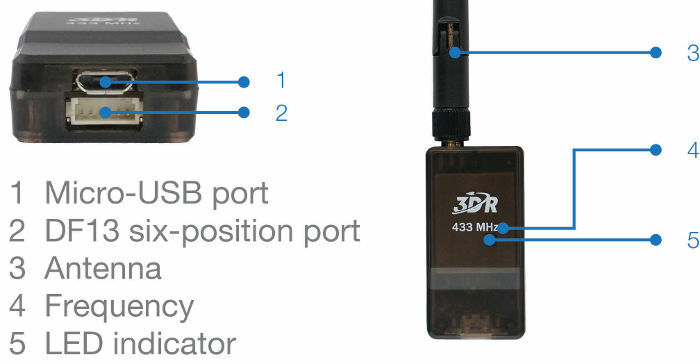 Use the 6-to-5 pin DF13 connector to connect the radio to your APM2’s Telem port Because of the limited number of serial ports on the APM2.x, the telemetry radio cannot be used while the board is also plugged in with the micro USB port. Select the new COM port, set the baud rate drop down (which appears between the COM port and Connect buttons) to 57600. Press the Connect button and if the two radios connect successfully you should be able to lean your vehicle left and right and see it’s attitude update on the MP’s Flight Data screen’s artificial horizon. Connecting the radio to an Android tablet using the L shaped micro USB cable (which should have been included with the radio). Then follow the directions in your preferred Ground Station app. Many users will not need to configure their radios! One case where you might do so is when you use your vehicle with others — in which case you will need to specify different radio channels (Net ID). Mission Planner supports configuring your radios using a simple GUI interface. 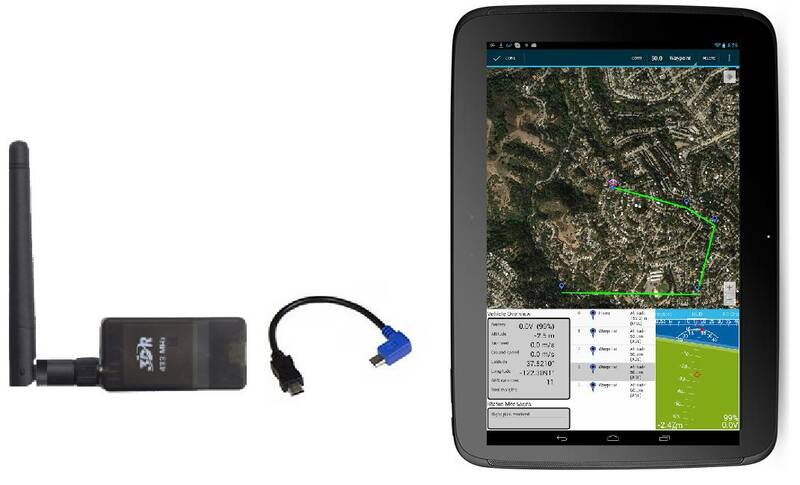 For more information see Configuring a Telemetry Radio using Mission Planner. Typical range achieved with the radios using standard configuration and antenna is around 500m, but the range varies a lot depending on noise sources and antenna setup. The first thing you should do when diagnosing range issues is the “one meter test”. Setup the two radios one meter apart and look at the local and remote RSSI. You should get a value of over 190 for a standard SiK radio. If you don’t then your antennas may be faulty or your radios may have been damaged. If you have ever run the radios without an antenna attached them the radio may have been damaged. If that test passes then have a look at your local and remote RSSI and noise from a flight. See the advanced setup page for detailed information on diagnosing range issues using telemetry logs. 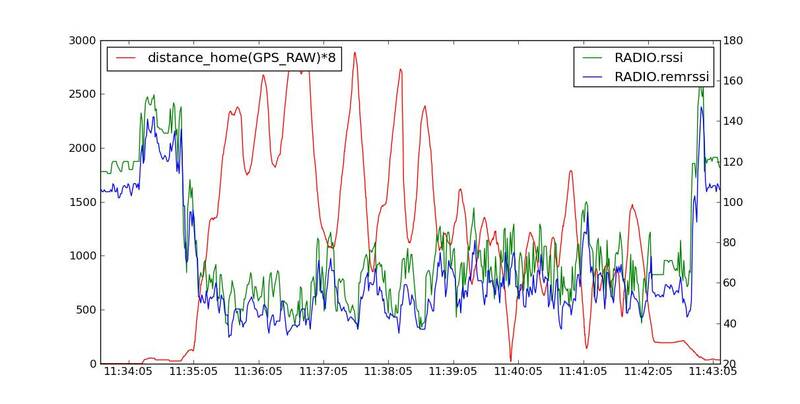 Reduce the AirRate parameter which will increase range but at the expense of the rate of the data transfer. The graph below shows the ground and remote receiver strength vs distance from home (in meters) for a test flight of a 3DR Radio (SiK implementation) on a SkyFun plane. The ground based radio was attached to a 3.5dB flat patch antenna. The SkyFun had a small ‘wire’ antenna. The graph shows the vehicle reached a distance of nearly 3km and the link was completely maintained throughout the flight. Although anecdotal, another user provided a Tlog showing a good link kept while the vehicle was 4.5km from the base station, using default radio settings for a 3DR 900 radio. The plane used a small omni antenna, and a 8dB patch antenna on the ground station. The best place to get involved with the development or tuning of these radios is the SiK Radios forum. Join in on the forum to help make these radios even better!